The tone of the whole clip is certainly an order of magnitude more intelligent than the more popular objections coming from that ideological end of the political spectrum, which as far as I have been able to tell has amounted to screaming "Socialism!" and "Death Panels!" and "Tyrrany!" and not much more. And while I don't share for the most part Goldhill's or Cato's perspective, I do agree, at least in theory, with some of the questions they raise. And (apparently) like them, I definitely believe that there are deep structural problems in American health care. That said, Goldhill absolutely screws the pooch on one particular point, one that he appears to regard as the centerpiece of why anything other than a 'pure' laissez-faire capitalist model is doomed to failure. Here he tries to peddle a myth just as insidious as the Death Panel nonsense. "The reason my local sushi bar gave its waiters hand-held ordering devices was not because of the National Sashimi Act passed by Congress...its because they want to get the orders right and [do it] quickly. They capture some of that benefit--and by the way, the customer captures some of that benefit--from that fairly simple thing. The lack of information technology investment in health care is not the problem. It's a symptom." I admire, from a rhetorical standpoint, his use of a well-grounded, easily visible example. And to a point, he's right: I work for a hospital on the weekends that uses a DOS program for its computerized order entry and electronic medical record. It's functional, I guess, but amazon.com would laugh a product like that out of its board room if someone came in and tried to sell it as the model for ordering books. Everything else at this hospital is state of the art: MRIs, CT scans, remodeled ICU & Surgical wings—all the stuff one can think of in a fine community hospital, but the information technology is from about two decades ago. And the good news (for the hospital) and the bad news (for you) is that they're no different from any other hospital—if anything, their system may be a little better because it's not prone to crash by being DOS based. There's only one problem with his analysis, one little fact that makes this apparently sensible criticism look like the canard that it really is. The fact is this: there is one computerized system that would fulfill Goldhill's wildest dreams. 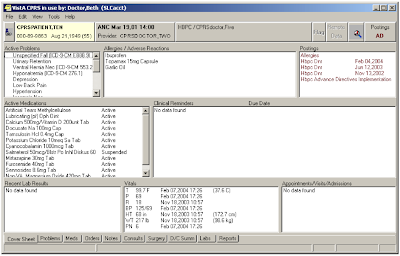 It's user-friendly, it combines the electronic medical record with computerized order entry, physicians love it. Even IT nerdy-types love it. And it's been around for more than a decade. What is this amazing piece of technology and why hasn't it revolutionized health care the way the home computer revolutionized small business? Well, it's called "VistA" (not to be confused with the Microsoft operating system), and it was not developed by someone trying to get shirts dry cleaned or a sushi order right—meaning it was designed without profit in mind. (I think that deserves an exclamation point: it was designed without profit in mind!) 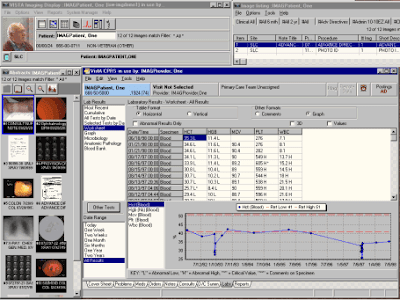 VistA is the computer system of the Veteran's Administration, was commissioned by the US Federal Government and began operating in 1997, and it was then and continues to be the Rolls Royce of healthcare information systems. Having worked at a VA during medical school, I can assure you that it was a joy to work with and I have yet to see its equal. As you can see here, VistA has a main page that has all the goodies a doc needs to retrieve the relevant info: a relevant medical history, a current medication list, links to scans, tests, notes, the whole shebang—just like having a chart in your hands only infinitely easier to deal with. Your Veterans benefit from this cost-effective, error-reducing system every single day—Lord knows they should—and they do it in a seamlessly linked nationwide system. If you're a Vet from the great town of Mansfield, Ohio and are on vacation in San Diego and you come down with appendicitis, the docs at the SD VA have your whole medical chart at their fingertips. Not bad considering how easy it is for patients to forget critical medications or allergies—assuming they are even conscious—where the lack of such information can lead to life-threatening complications. Meanwhile "private" medicine continues to struggle with thousands of different systems all over the country, few of them integrated (as an east coaster, I cannot comment on Kaiser Permanente's system with which I have no firsthand experience), and none that I have seen best the VA's Little Information Engine That Could. PS--The blog is back! We took some time off, but are planning on weekly visits from now on. Please continue to drop in suggestions, questions, links and quibbles. Glad that you are back. I look forward to reading your posts.